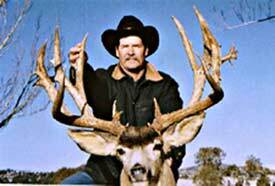 Western Slope Outfitters offers the serious trophy hunter a variety of exciting hunting adventures. Western Slope Outfitters offers the serious trophy hunter a variety of exciting archery, rifle and muzzleloader hunting adventures, including whitetails, mule deer, turkey, wild boar, elk, brown and grizzly bears, Alaskan-Yukon moose, Dall sheep and Mountain Goat. It's no secret that the State of Kansas produces World Class whitetails, and Western Slope Outfitters can lead you to them. We have acquired the exclusive rights to hunt property that has never been commercially hunted until now. Bucks scoring between 165 and 190 are common on these farms. No bucks were taken during the 2005 season, making the 2006 season prime for taking home a real trophy! Alaska is home to a host of Big Game species and we pursue the majority of them. Our Alaskan Dall Sheep hunts are for the serious sheep hunter looking to harvest a trophy Dall sheep. These hunts are conducted in the world famous areas of the Chugach Mountains -- Alaska game unit 14C and TOK Management Area (TMA). These two areas are known throughout the world sheep hunting communities for holding outstanding trophy Dall sheep. These are the most prized trophy Dall sheep hunting areas in Alaska and North America. We also offer hunts for brown and grizzly bear, the huge Alaskan-Yukon moose and Mountain Goat. Our Colorado archery elk hunts are conducted during the prime periods of the rut. If you have ever wanted to hunt trophy elk with a bow this is the hunt for you. The bulls are rutting hard and the battle of the herd bulls has begun. There are few hunts in nature's wilds that will test the nerves and skills of an archery hunter like this. We place this hunt among the top! We also offer a down-home Tennessee wild boar hunt. If you want to see wild hog hunting in its purest form in some of the most scenic and remote country in the Appalachians then look no further than Western Slope Outfitters. For more information on available dates and price quotes go to Jeff Burrell's Western Slope Outfitters web site below. To book a hunt now call: 877-417-6788.